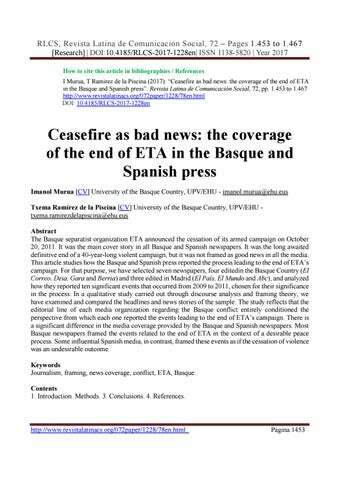 Ceasefire as bad news: the coverage of the end of ETA in the Basque and Spanish press Imanol Murua [CV] University of the Basque Country, UPV/EHU - imanol.murua@ehu.eus Txema Ramírez de la Piscina [CV] University of the Basque Country, UPV/EHU txema.ramirezdelapiscina@ehu.eus Abstract The Basque separatist organization ETA announced the cessation of its armed campaign on October 20, 2011. It was the main cover story in all Basque and Spanish newspapers. It was the long awaited definitive end of a 40-year-long violent campaign, but it was not framed as good news in all the media. This article studies how the Basque and Spanish press reported the process leading to the end of ETA’s campaign. For that purpose, we have selected seven newspapers, four editedin the Basque Country (El Correo, Deia, Gara and Berria) and three edited in Madrid (El País, El Mundo and Abc), and analyzed how they reported ten significant events that occurred from 2009 to 2011, chosen for their significance in the process. In a qualitative study carried out through discourse analysis and framing theory, we have examined and compared the headlines and news stories of the sample. The study reflects that the editorial line of each media organization regarding the Basque conflict entirely conditioned the perspective from which each one reported the events leading to the end of ETA’s campaign. There is a significant difference in the media coverage provided by the Basque and Spanish newspapers. Most Basque newspapers framed the events related to the end of ETA in the context of a desirable peace process. Some influential Spanish media, in contrast, framed these events as if the cessation of violence was an undesirable outcome. Keywords Journalism, framing, news coverage, conflict, ETA, Basque. Contents 1. Introduction. Methods. 3. Conclusions. 4. References. RLCS, Revista Latina de Comunicación Social, 72 – Pages 1.453 to 1.467 [Research] | DOI:10.4185/RLCS-2017-1228en| ISSN 1138-5820 | Year 2017 meaning to certain realities; in this case, to the point that peace as good news became peace as bad news. Article received on 20 August 2017. Accepted on 15 November. Published on 23 November 2017.